By the end of its career, space shuttle Discovery will have flown 39 space missions since its first flight in 1984. Over that time, countless dedicated engineers and technicians serviced the spacecraft. Here, Discovery's current team walks the shuttle out to the Vehicle Assembly Building to meet its fuel tank and rocket boosters on Sept. 9, 2010. CAPECANAVERAL? Even for many Kennedy Space Centeremployees, it can be rare to see a shuttle up-close. OnThursday,hundreds seized the chance to payrespects to Discovery as it rolled from its hangar to the Vehicle Assembly Building for whatis expected to be thelast time. Theshortmove known as a "rollover" typically takes only about 30 minutes. Butthistime NASAlet Discovery linger, parking the spacecraft outside itshangar for severalhours to allow employees to take pictures. "I'vebeen here 27 years. The first time I've had a picture in front of ashuttle isnow," said 46-year-old Domita Gilmore of Cocoa, a United Space Alliancefield engineer. Astheshuttle fleet nears retirement, NASA and the space center areoccasionallyloosening strict operating procedures in an effort to recognize andthankemployees, including thousands of contractors who face layoffs over thenextyear. Thecenter hasorganized "moraleevents" that provide photo opportunities with the shuttle,offeraccess to restricted facilities and allow workers to leave a lastingpersonal mark. "It'samazing, all the folks and all the work they do," said Angie Brewer, aNASA manager who oversees Atlantis' preparations for flight and ishelping toorganize the events. "They sacrifice a lot with their families and thetime constraints that we deal with." Theeventsinclude shuttle moves, tours of orbiter hangars and opportunities tosign awall in the assembly building. Morethan3,500 names now line a concrete wall in the assembly building'scavernoustransfer aisle, framed by a shuttle emblem and a sign that reads "AnAmerican Treasure: TheSpaceShuttle." "There'sa lot, a lot of history on that wall," said Tim Seymour, a 51-year-oldUSAemployee and member of the "closeout crew" that straps astronautsinto their seats and closes the shuttle hatch. Theagencytook care to select a black Skilcraft marker and a white paint base forthewall that wouldn't easily fade. Seven-by-sevengrids taped to the wall frame neat boxes for employees to write intheir names,which they can do twice a week on different shifts. OneNASAengineer signed on behalf of a retiree who no longer has access to thecenter. Attimes,it's difficult for the technicians, engineers, administrative staff andothersparticipating in the events to contain emotions, as they reminisceaboutworking with the shuttle and confront the program's imminent end. DonaldMeinert, another closeout crew member who has signed the wall,rememberedworking alongside the Challenger and Columbia crews before they werelost. "Youhave triumph the vast majority of the time, and . . . and then youdon't,"said 53-year-old Meinert, of Mims. "It always chokes me up. There aretimes when it's really, really personal." OnThursday,41-year-old Melanie Moon of Titusville, a 21-year shuttle programveteran, heldback tears thinking about Discovery rolling to the assembly building inpreparation for its final scheduled mission, targeted to launch Nov. 1. Eachday,Moon keeps track of all the people, tools and equipment that enter orleaveDiscovery. "Youform a bond with it, because that's the one that you take care of," shesaid. "You see it through from liftoff to wheels stop." Settingupphoto opportunities seems a simple enough gesture for NASA, but it'sactuallycomplex. Managerscarefully monitor weather and other operational concerns to be surework on theshuttle isn't compromised. Each event is coordinated with security. OnWednesday, a water main break closed the center, delaying Discovery'srollover. On Thursday, Discovery would have bolted into theassemblybuilding and skipped the photos if rain was approaching, but rain heldoffuntil the afternoon. Brewersaidthe feedback has been so positive that some wish NASA had startedhostingsimilar events long ago. "It'snice to have folks be able to see the shuttle and say, 'I'm a part ofthis,'" she said. TwomoreDiscovery viewing events are planned if conditions permit, and someemployeeswill be able to invite family along. NASAplansto start rolling Discovery out to launch pad 39A at 8 p.m. Sept. 20,about fourhours earlier than usual so it's before most employees and theirfamilies go tosleep. The next day, the pad's rotating tower will be held open topermit rarephotos of the shuttle on its pad, as if poised for launch. Theeventsare perhaps most rewarding for employees like Gilmore, who support theprogramin important ways but don't get to see the shuttle frequently. "Eventhough you don't actually work on the shuttle, we all have a job to doand wetake it seriously, very seriously," said Gilmore, who works on computersystems related to ground support equipment. "It's sad to see it go." 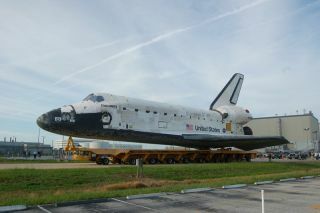 Clickhere for aphoto galleryof Discovery's final rollover. Publishedunder license from FLORIDA TODAY.Copyright ? 2010 FLORIDA TODAY. No portion of this material may bereproducedin any way without the written consent of FLORIDATODAY.